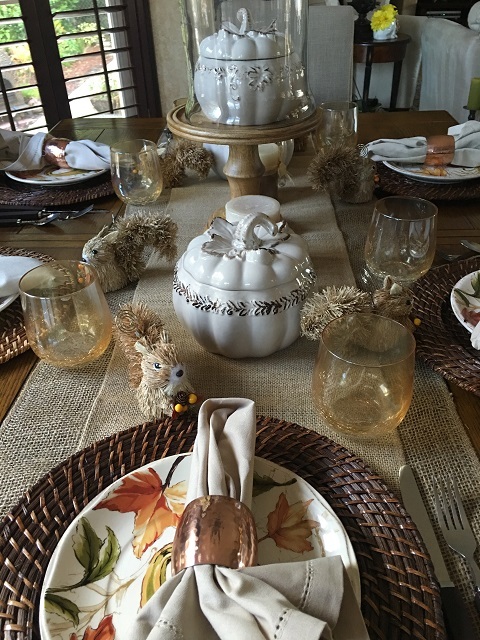 Using woodland animals in a fall and autumn tablescape and decor. Good morning, my dear readers…..I thought since I have been talking “Fall” for several posts…. 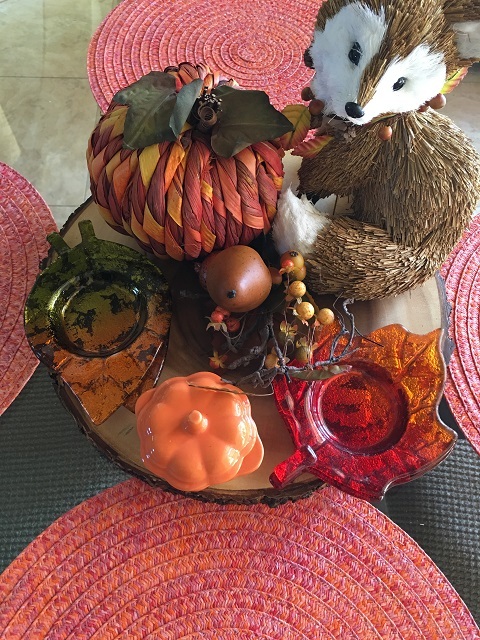 that I would share with you a little tour of my Fall decor. My confession is, I always decorate for the Holidays…it used to be for my kids and then I realized that it was for the biggest “kid” of all…..ME!!! When I think of Autumn and all the beautiful colors of the leaves….it makes me think of woods and forests! And when one thinks of the woods, …one can not help but think of foxes, squirrels and all sorts of wood-sy animals and that is what I used for a theme this year. This is my breakfast nook area…I used a round slice of tree with the bark still attached and on that slice, sits a fox and dessert plates. 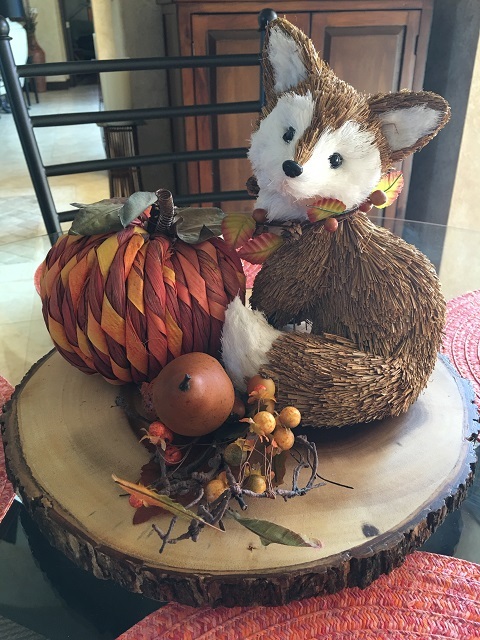 I mean, one has to have a Fox sitting on a slice of tree and dessert plates at the ready….am I right? I found the foxes (there are several others sitting around) at Pier 1. The round dining table is glass and I used orange-y colored place mats that I picked up at HomeGoods a couple years back. 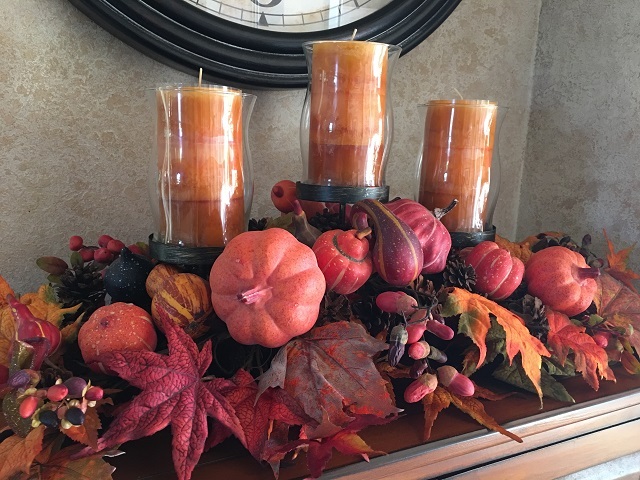 My sidebar holds an arrangement that I bought at Hobby Lobby while living in Kansas City…so it has been around for many years. I added the candles and change them out from time to time. I store this large centerpiece covered in plastic and it does take up space, but I just can’t part with it! I do have to give it a quick dusting before sitting it out…and I will continue using it until it bites the dust…no pun intended! This is my formal dining room tablescape which is pretty simple, but I really like it that way. 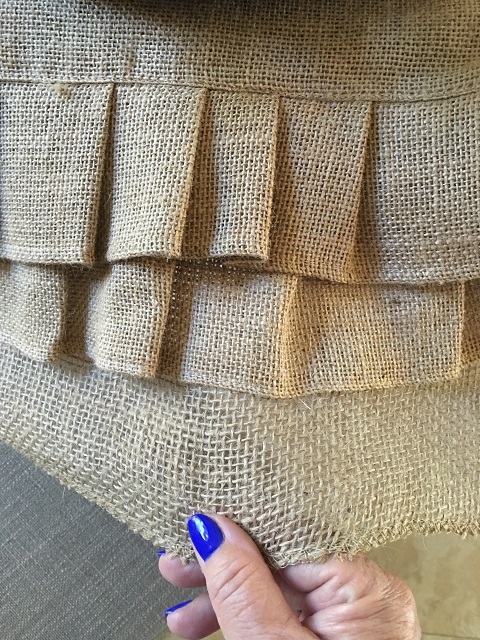 I started with a burlap table runner…you can find these at Michaels in the Floral section. I used a burlap runner for that wood-sy feel and I feel it grounds the tablescape. I added a second table runner on top of the burlap runner, because I liked the density of this burlap material and because it had a ruffle to soften the look. 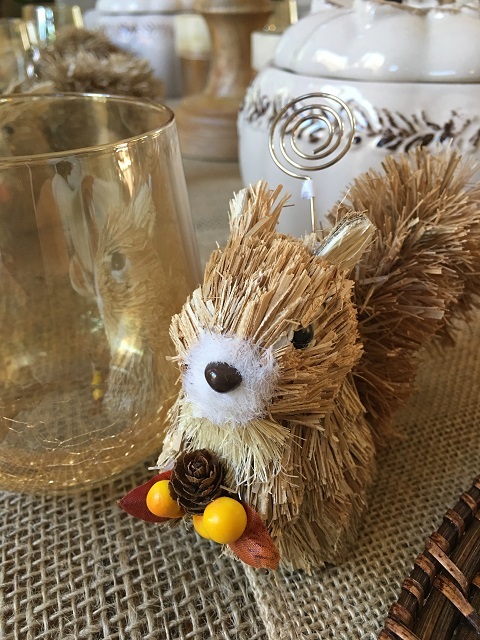 I found the drinking glasses last year at Pier 1, and this year I picked up these cute little squirrels which hold a name card. I just think they are so cute. I sent a pic of the squirrels to only daughter, and she showed them to my great-grandson and he kissed the pic of them. I think that is so sweet. 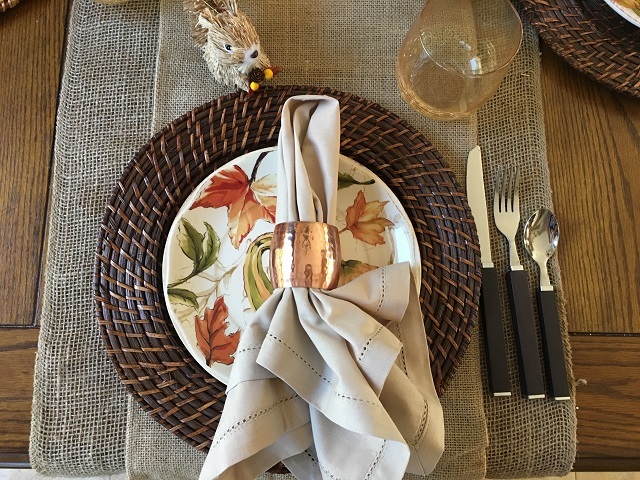 For my place setting, I used my “woody” look flatware that I have had for years….and my rattan chargers. The hammered copper napkin rings sometimes go on one of my Christmas trees, along with copper cookie cutters! This year I added the pumpkin bakers with lids in a mushroom color. There are 3 of them in various sizes… with the larger holding 1.5 quarts, the middle one is a 1.25 quart size and the smaller one holds 28 ounces. They are from the Temptations Bake Ware Collection and I ordered them online and plan to use them for my Thanksgiving Dinner. 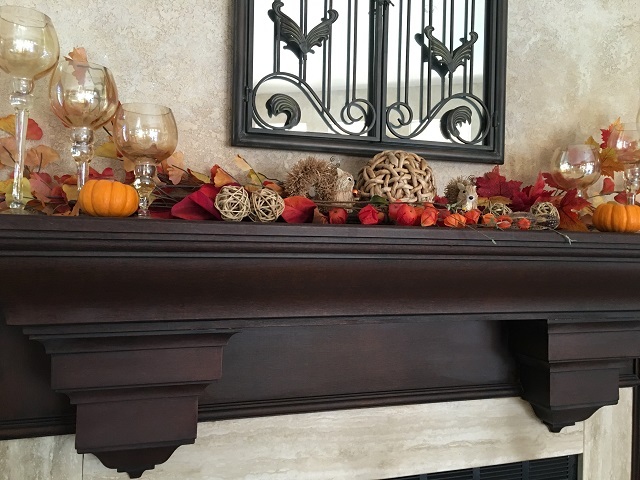 This is the fireplace mantle….which I find is always fun to decorate. There are a few gourds and squirrels among the fall leaf sprays. There are 6 stemmed glass candle holders in various sizes that I bought at a garage sale several years back. 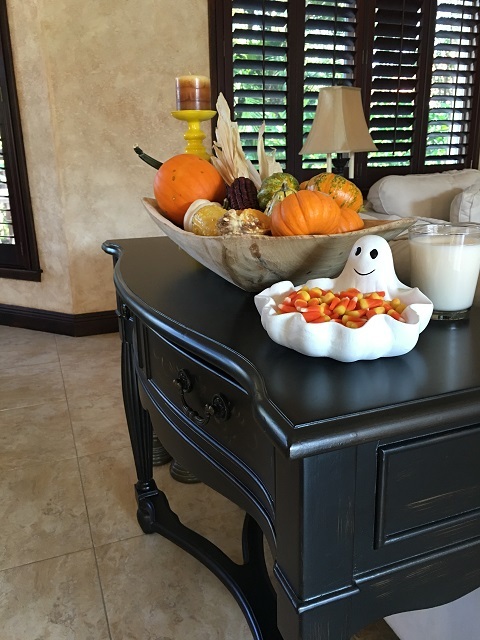 The sofa table holds my antique dough bowl and a ghost candy dish holding candy corn. 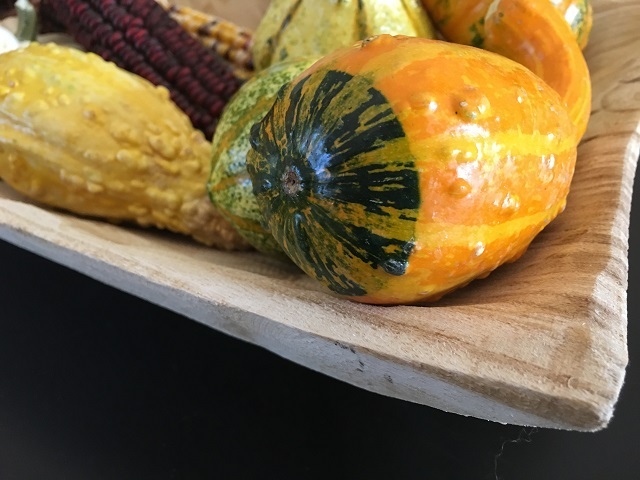 I placed Indian corn, a few gourds and pumpkins in the dough bowl and they are real. 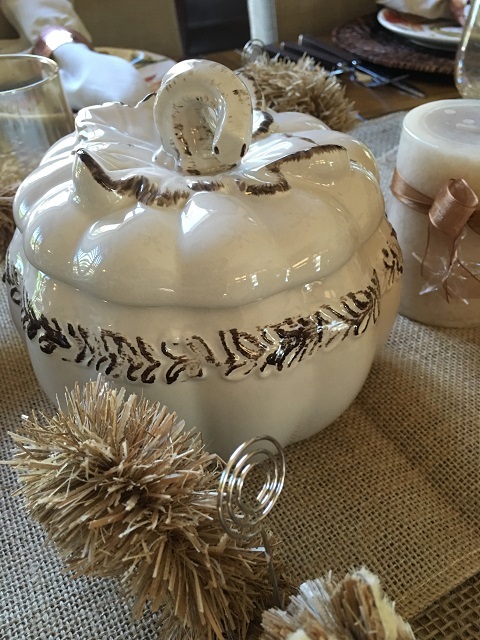 However, I prefer realistic faux pumpkins because the real ones don’t last very long….at least not in this house. 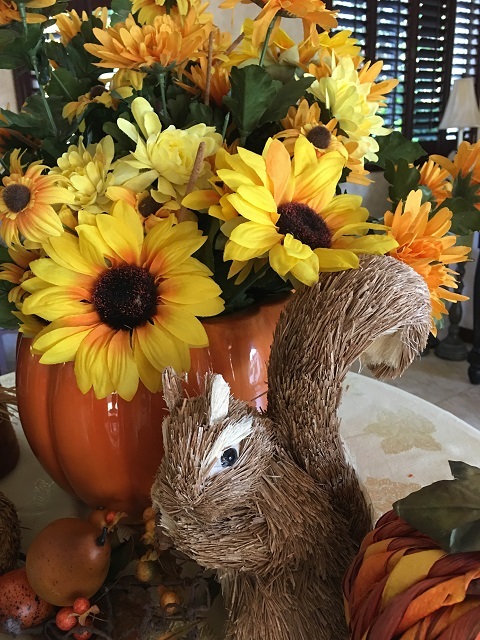 The entry table holds another squirrel and a ceramic pumpkin full of sunflowers and mums. And I just had to add a bit of whimsy…. 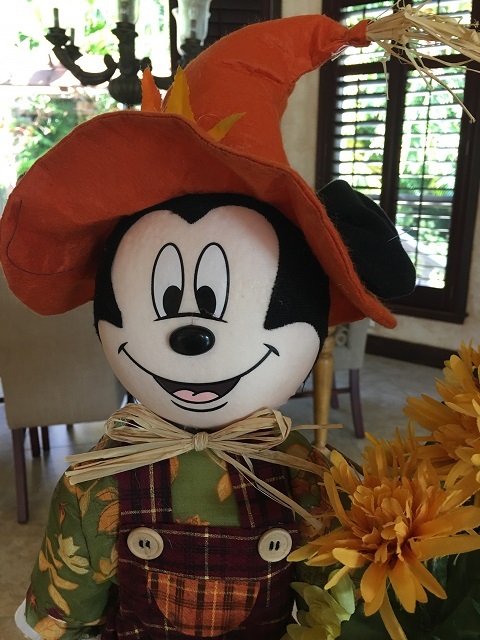 so Mickey Mouse donned an orange hat and overalls and welcomes guests to our home. 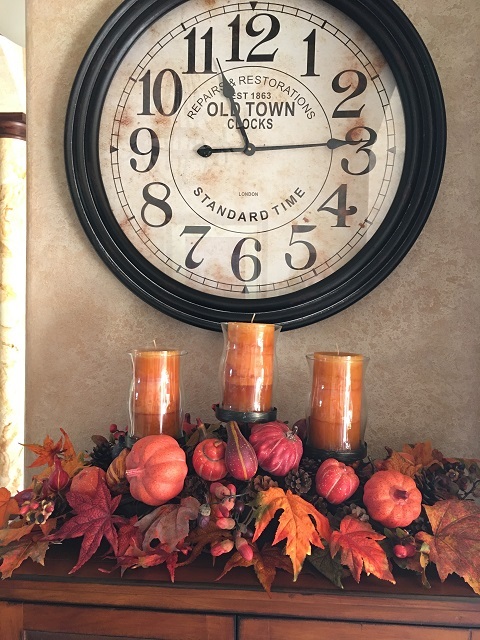 I hope you enjoyed my little tour of Fall Decor….and I hope you are enjoying the cooler Fall weather in your neck of the woods. « Quick And Easy To Make Halloween Treats For A Party… Or Just For You! Transforming! One can tell you have lived in environments other than Florida to appreciate the woodsy feel and autumn colors. So cute and creative! I especially like the squirrels and fox. Mickey Mouse ain’t bad either!! Your table is beautiful. Wish I could be there to see in person. Thanks for sharing. Thanks Janet for stopping by…I wish you were here too….we could have a cup of tea and piece of pie. I just made a pumpkin pie!